Seal and insulate air leaks in ductwork located in attics or crawl spaces. Follow these steps for a low water-using, yet beautiful, landscape. Create a scaled drawing of the lot, including buildings and walks. Identify sunny and shady areas, slopes and views. Evaluate the needs of people using the landscape. Do kids and pets need a big open area? Is a large deck for entertaining important? Group plants with similar water needs to make watering easier. 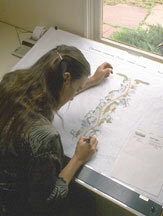 Phase in the landscape plan as money and time allow. Good soil absorbs and retains water better than poor soil. Send a soil sample to a soil lab to determine nutrient content. Most Colorado soils benefit from adding two to three cubic yards of organic matter, such as commercial compost or aged manure, for every 1,000 square feet of landscape area. Even the lowest water-using Xeriscape needs supplemental water during extended hot, dry periods. Grass: use low-volume, low-angle sprinklers. Trees, shrubs, flowers and ground covers: use drip, spray or bubbler emitters. Adjust your watering times monthly to meet seasonal needs. Efficient hose-end sprinklers throw large drops of water, not a mist, close to the ground. Water deeply and infrequently to develop deep roots. Water between 9 p.m. and 8 a.m. to reduce water loss due to evaporation. Read about water-efficient sprinkler systems. Confine the lawn to high traffic areas and areas where it will be used. Kentucky bluegrass requires 24-26 inches of supplemental irrigation in a normal precipitation year, compared to Fine Fescue which requires 18-20 inches and Buffalograss which requires 8-10 inches. 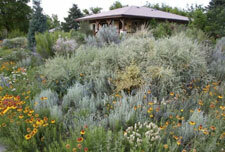 Wildflowers and native grasses are excellent lawn substitutes. Shrubs, perennials and ground covers use less water and provide a cool, green appearance. Place mulch around driveways or as paths. Expand outdoor-living areas by installing decks, patios and walkways. Zone together plants with similar water and sunlight needs. Nurseries carry trees, shrubs, perennials and groundcovers that are low water-using. Install a variety of plants with different heights, colors and textures. Choose plants for their seasonal interest, including fall color and/or interesting berries, bark or seed heads. 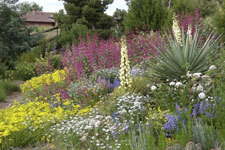 Check out Utilities' Xeriscape Plant List. Cover planting areas with 2-4 inches of mulch to conserve soil moisture, control weeds and add interest to the landscape. Bark chips, shredded wood chips or pole peelings decompose and improve soil texture but need to be restored from time to time. Rock and gravel mulches are practical in windy spots and unplanted areas. Apply mulch directly to the soil surface or over a landscape fabric. Do not use black plastic; it prevents air and water from reaching plant roots. Proper maintenance is essential for getting the most out of your xeriscape. Check trees and shrubs for pruning needs once a year. 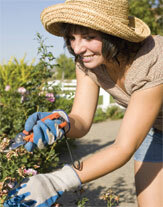 Frequently prune flowering perennials to stimulate blooming. Mow grass when it is about 1/3 higher than the desired height. Leave clippings to recycle nutrients into the soil.